For many, the colder weather means a trip to the snow with friends and family is on the cards. Mary Dawes, Director of First Aid For You, is encouraging ski-goers to be “Ski-Smart” by following a few simple steps. Many emergencies in the snow are often the result of people being over confident in conditions where they are unfamiliar with the terrain and environment. Dress appropriately – Alpine weather can change rapidly, a sunny morning can quickly turn grey, cold, and wet. Wear insulating layers and wherever possible stay dry—waterproof clothing is a MUST. Anyone with Asthma should have a written asthma management plan while they’re on holiday. Make sure you have enough of your prescription medication; don’t rely on local chemists having stock of what you may require. In freezing conditions, pressurised inhalers may not work properly. Warming the device in your hands may help. For those people with Diabetes, discuss with your doctor the proposed activities and work together to develop a new dose schedule for your medication. If you do feel yourself becoming hypoglycaemic while out in the snow, have some simple carbohydrates immediately – DO NOT WAIT. Before you head off for the day on the snow, put the phone number of the local ski patrol in your mobile. If you think you are lost – STOP and THINK. Identify your last confirmed position and estimate your present location. Decide if you will proceed or if you will stop and wait for assistance. If you do stop and you have mobile signal, call for help, either the local ski patrol or 000/112. Select a site out of the wind and use trees, logs, or rocks as wind breaks, and use skis or branches to mark your location someplace where it may be visible. For those with children skiing for the first time, call up the ski field where you’ll be spending the majority of your time, ask about ski lessons and content, enquire about what safety equipment they use, how many rest-breaks your child will have through the course (if food will be provided, it’s a good idea at this time to notify them of any allergies your child may have) and if there are any prerequisites for your child to attend the lesson. At the ski resort, request for instructors with experience with special needs, as many workers are casuals for the season and often from other countries. It’s best to check and ask questions first, before your arrival and again, prior to beginning classes. Dress your children in high visibility clothes, this will ensure they you can spot them at all times and be able to identify them among other children. With a marker, write on your child’s forearm your best contact phone number, as a compromise, you may want to allow your child to have a temporary tattoo to accompany the phone-number. If at all possible, see if you can meet any of the other children who will be in your child’s group for ski lessons prior. This will help your child overcome any potential anxiety issues. Your child may, understandably be a bit nervous prior to the first lesson. Emphasise to them that this will be fun, there’ll be other children with them and that the ski instructors are there to make sure you’re safe and have a great time. If there is an accident, help is only at the bottom of your feet… That’s right – snow! For bumps and bruises, a cold compress can be made with a plastic bag and snow on the affected area to relieve pain. Additionally, wear wrist guards, remembering goggles or sunglasses to protect eyes – young and old – from harmful UV rays. 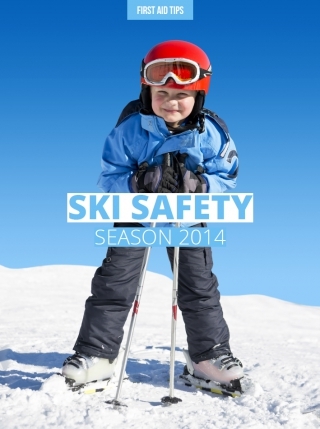 Most importantly, enjoy your time on the snowfields with friends and family and to act sensibly.